Danish post punk/new wave band The Foreign Resort will release their new album New Frontiers on October 28th in the U.S. via BLVD Records. The group will be touring the U.S. this week, beginning October 9th in Los Angeles. Check out the song “Flushed” below, which nails the moodier textures of post punk with vocals that start off at a somber mid-range and then expand outward. This upcoming tour will also include a stop at CMJ, so check them out if you’ll be there! Since 2010, the band has been rigorous in booking over 250 shows – most of them in the US as well as showcases at SXSW, Icelandic Airwaves, CMJ Music Marathon (incl. 2014) and the world’s largest goth festival Wave Gotik Treffen in Leipzig, Germany. This enabled them to develop a wider fan base, as well as becoming part of the burgeoning noise pop scene – evident through rotation, interviews, and live performances at radio stations throughout the US as well as in Europe. Other international bands have also welcomed them on their tours such as The Raveonettes, A Place to Bury Strangers and Swervedriver. Outlets like Consequence of Sound as well as Danish GAFFA and Soundvenue have praised The Foreign Resort. The Big Takeover wrote “This band is epic!” and UK’s Louder Than War stated about their release Scattered & Buried: “It’s an amazing album, which puts The Foreign Resort firmly on the radar, hailing them as the most exciting band to come out of Denmark since The Raveonettes”. 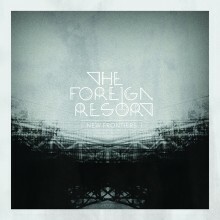 The Foreign Resort’s latest album New Frontiers was produced by John Fryer (Nine Inch Nails, Cocteau Twins, PJ Harvey). The album was released in Denmark in February 2014 and will be out in the US via BLVD Records on October 28th. The singles “Dead End Roads” and “Alone” are currently in rotation at several radio stations across the United States and Europe and were featured in Under The Radar Magazine, Seismic Sound and High Voltage Magazine as well as several Danish music blogs.